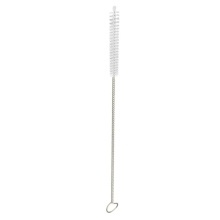 100% Brand new and good quality cleaning brush for multiple size straws. Made of sturdy stainless steel with soft nylon bristles, reusable and flexible cleaning brush tool, very easy to use. Made of sturdy stainless steel with soft nylon bristles. Suitable for cleaning multiple size straws. Bendable design, very flexible, easy to use it to clean the drinking straw. Multi-purpose cleaning tool, not only for cleaning straws, but also for cleaning funnel neck, teapot neck, tube or cylinder or other hard to access corners, very practical.